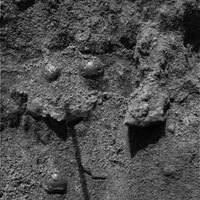 This image, taken by the microscopic imager, an instrument located on Opportunity 's instrument deployment device, or "arm," reveals shiny, spherical objects embedded within the trench wall at Meridiani Planum, Mars. By inspecting the sides and floor of a hole it dug on Mars, NASA's Opportunity rover is finding some things it did not see beforehand, including round pebbles that are shiny and soil so fine-grained that the rover's microscope can't make out individual particles. "What's underneath is different than what's at the immediate surface," said Dr. Albert Yen, rover science team member at NASA's Jet Propulsion Laboratory, Pasadena, Calif. Meanwhile, NASA's other Mars Exploration Rover, Spirit, has reached a site with such interesting soil that scientists have decided to robotically dig a hole there, too. Spirit's trenching at a shallow depression dubbed "Laguna Hollow" could answer questions about whether traits on the soil surface resulted from repeated swelling and shrinking of an upper layer bearing concentrated brine, among other possibilities. Opportunity has manipulated its robotic arm to use its microscope on five different locations within the trench the rover dug on Monday. It has also taken spectrometer readings of two sites. "We've given the arm a very strenuous workout," said JPL's Dr. Eric Baumgartner, lead engineer for the arm. The accuracy of the tool placements -- within 5 millimeters, or less than a quarter inch -- is remarkable for mobile robotics on Earth, much less on Mars. Once data are analyzed from the alpha particle X-ray spectrometer and the Mössbauer spectrometer about what elements and what iron-bearing minerals are present, the differences between the subsurface and the surface will be easier to interpret, Yen said. While Opportunity has been digging and examining its trench this week, it has also been catching up on transmission of pictures and information from its survey last week of a rock outcrop along the inner wall of the small crater in which the rover is working. Both rovers can communicate directly with Earth, but JPL's Andrea Barbieri, telecommunication system engineer, reported that 66 percent of the 10 gigabits of data they have returned so far has come via relays by NASA's Mars Odyssey orbiter and another 16 percent via relays by NASA's Mars Global Surveyor. Based on the outcrop survey, scientists have chosen a feature they have dubbed "El Capitan" as the next target for intensive investigation by Opportunity. "We've planned our assault on the outcrop," said Dr. Steve Squyres of Cornell University, Ithaca, N.Y., principal investigator for the rovers' science instruments. "The whole stack of rocks seems to be well exposed here," he said of the chosen target. Upper and lower portions appear to differ in layering and weathering characteristics. Planners anticipate that Opportunity's arm will be able to reach both the upper and lower parts from a single parking spot in front of "El Capitan." Halfway around the planet, Spirit will be told to use a front wheel to dig a trench during the martian day, or "sol," that will end at 12:36 p.m. Friday, PST. Some soil in "Laguna Hollow" appeared to stick to Spirit's wheels. Possible explanations include very fine-grained dust or concentrated salt making the soil sticky, said Dr. Dave Des Marais, a rover science team member from NASA Ames Research Center, Moffett Field, Calif. Pictures of the surface there also show pebbles arranged in clusters or lines around lighter patches Des Marais described as "miniature hollows." This resembles patterned ground on Earth that can result from alternating expansion and shrinkage of the soil. Possible explanations for repeated expanding and contracting include cycles of freezing and thawing or temperature swings in salty soil. After trenching to seek clues about those possibilities, Spirit will continue on its trek toward the rim of a crater nicknamed "Bonneville," now estimated to be about 135 meters (443 feet) away from the rover. Spirit has already driven 128 meters (420 feet).